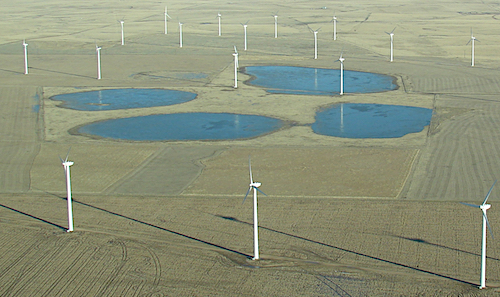 The western Great Plains provides abundant energy resources—from oil and gas to wind and solar—but often the necessary infrastructure needed to capture that energy is placed in the middle of or near playas. To help energy developers understand the importance of playas and how to preserve their functionality as wildlife habitat and recharge wetlands, PLJV recently developed energy development siting recommendations near playas. The siting guidelines advises all energy development avoid playa clusters and large isolated playas, which are important stopover sites for waterfowl, shorebirds and waterbirds, as well as the birds that prey on them. In developing these guidelines, our goal is to provide energy developers with a tool that will significantly reduce future impacts to migratory waterfowl and shorebirds, as well as reduce the potential for regulatory exposure. Playas also recharge the Ogallala Aquifer by allowing percolation of surface water through the clay layer of soil in the basin at a rate 10 to 100 times greater than through inter-playa areas. Energy development on playas may limit this hydrologic function.